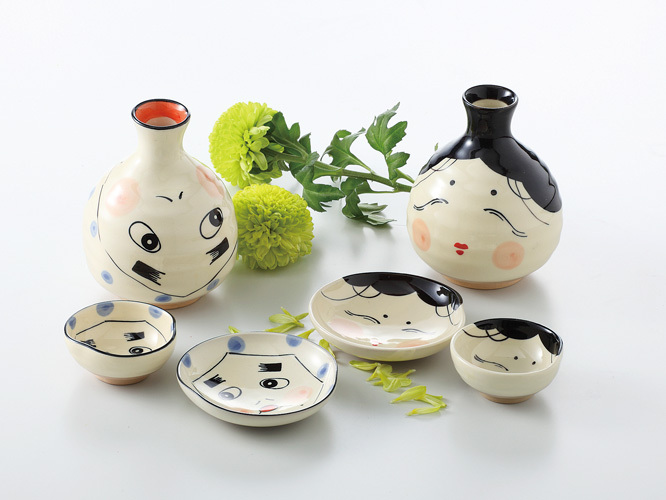 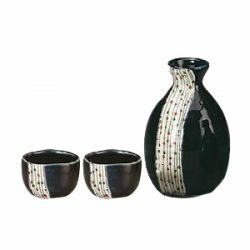 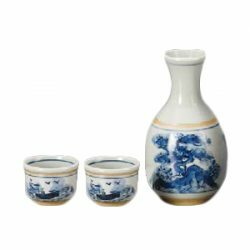 This unique sake vessel set is a Seto ware creation with its design based on the front of the Japanese tradition mask Okame. 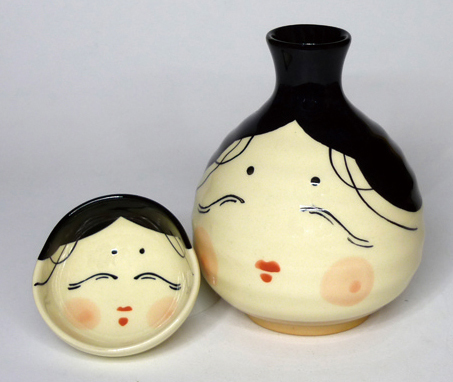 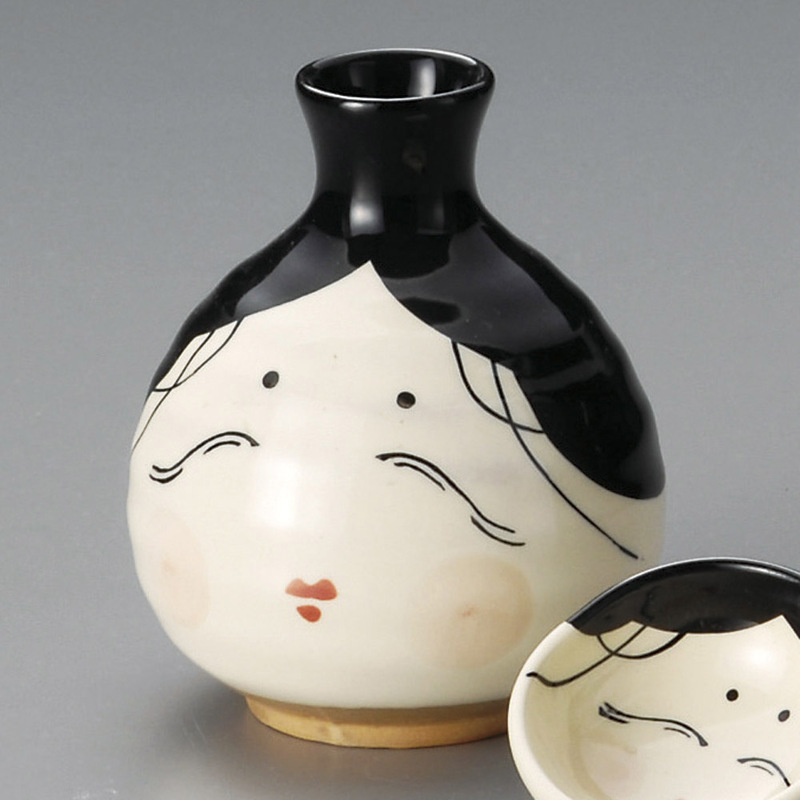 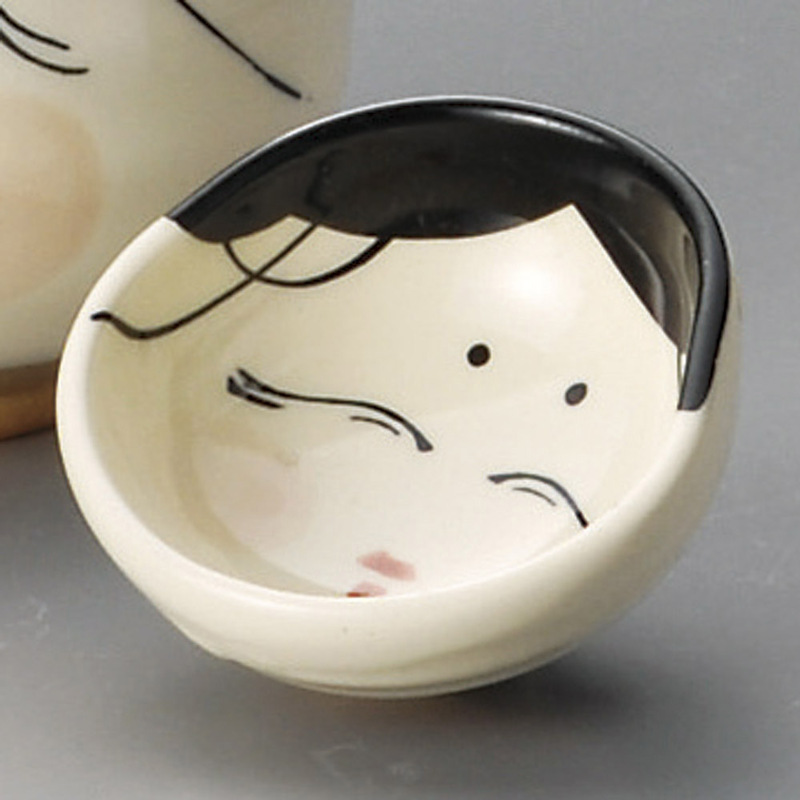 The design of laughter from the corners of the eyes brings feelings of laughter to the users of the sake vessel as well. 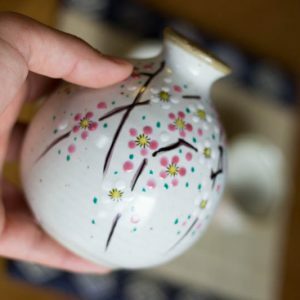 This hatame, or outward appearance, is considered a lucky talisman in Japanese culture, the perfect sake vessel for happy occasions or the night before a possibly successful event takes place. 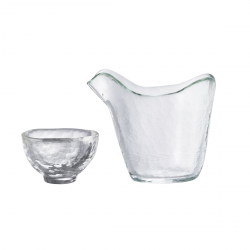 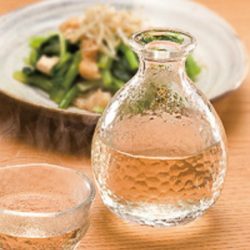 Being Seto ware or Mino ware, it is stronger than glass vessels so it may be used on an everyday basis without any worries. 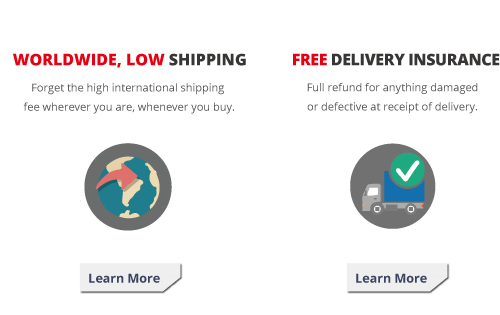 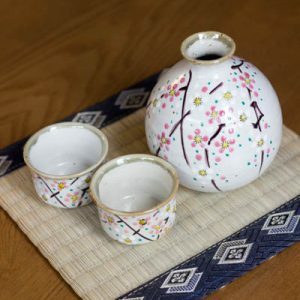 The durable ceramic has a smooth touch, and the tokkuri and guinomi “fits” into the hand for comfort while using. 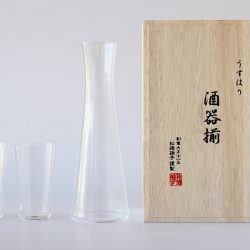 through skillful techniques, there will be no complaints of Sake losing its sharpness due to the use of the tokkuri. 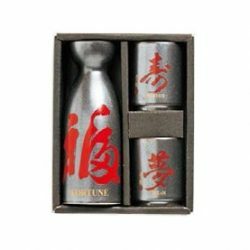 The sensation from the edge of guinomi, the characteristic gentle curvy lines, raises the mellow sensation when drinking heated Sake. 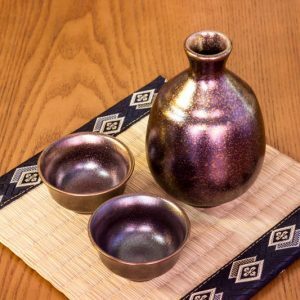 This sake vessel set is for hot sake allowing the Sake to warm the body with the unique design the warm the eyes. 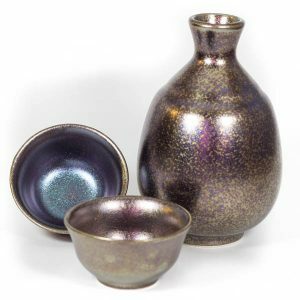 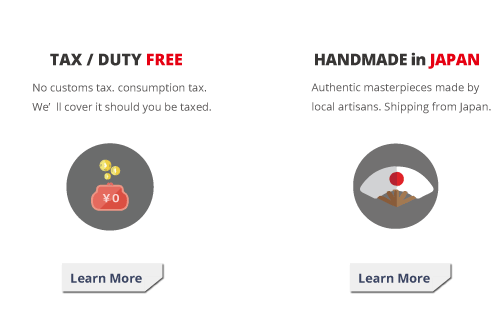 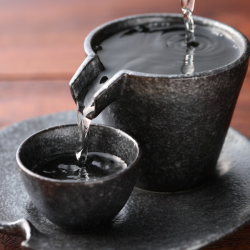 In addition to the guinomi, the set includes hai, shallow sake cups, as well. 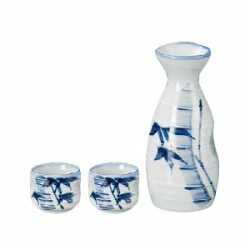 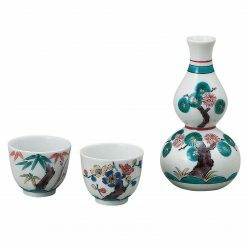 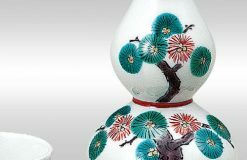 Being able to use guinomi or hai according to the type of Sake, this sake vessel set allows Sake lovers a diversity of Sake choices. 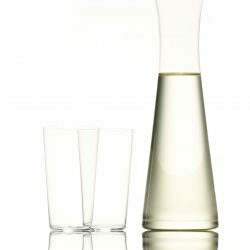 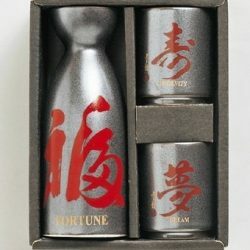 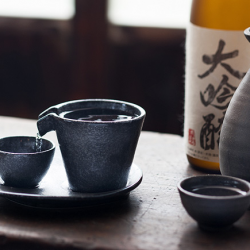 Sake cups with a wide brim, opening, allow the aromas to be enjoyed, so one possible usage could be separating guinomi from Junmai Shu, and Ginjo Shu for hai.